Like the bulk-food isle at the grocery store, buying a Nissan Versa is a great way to get a lot of car for not much money. 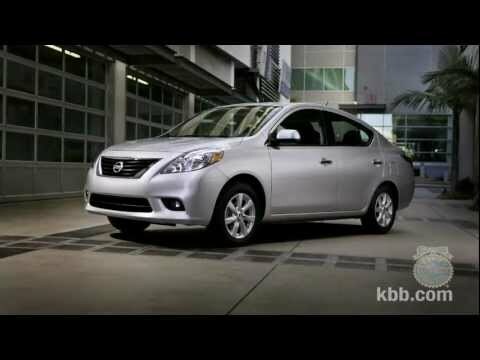 Roomy, comfortable and cheap, the new-for-2012 Versa sedan's charms taper off from there, leaving buyers who cherish style and fun to look elsewhere. The 2012 Versa hatchback carries over from 2011. I bought my car used two years ago and it runs great. I have never had a problem with it breaking down or leaving me stranded anywhere due to any type of defect. It has over 90,000 miles on it and still runs great. It gets good gas mileage, at least 30 miles to the gallon. This makes it more economically friendly for you as the customer. I personally think that it has a good stereo system, with options for radio, cd, and aux already set into it, so I can play music from my phone. There are only two real downsides that I have noticed with this car. First, there isn't much sound proofing for the car, and therefore you can hear a lot of road noise. Second, the car is close to the ground, so in the winter with snow, there isn't much clearance, making it impossible to drive if the snow is too deep. Neither of these two problems have impacted me too much, I just wait for plowed roads and shovel snow in my own driveway, and turn my music up a little more than I normally would. Had I known about these when I bought the car, I definitely would have still bought the car, because it runs very well overall. It has a ton of recalls. 2 on the airbags alone, one on a knob on the shift handle and one on the gas pedal . Plus I truly believe that this car is only made to last 5 years and after that you're on borrowed time. Well for starters it's starting to fall apart. I love the gas mileage on it as I get 34.8 miles per gallon but in the past 2 weeks replaced a fan, thermostat, and battery. Now my car won't start and we don't know what's wrong. Very disconcerting that this car is only 5 yrs old and is starting to fall apart. Guess I'm going to have to get rid of it and go back to either a Toyota Camry or Honda Accord. The biggest complaint I have since I've owned this car is 4 recalls in less then a year and now the car is falling apart. I took great care and do routine maintenance on my car and this shouldn't be happening. I think b/c this was a promo sale it was calculated to only last a few years compared to other models. Very sorry I every bought this car. My son in law who helps us maintain it keeps asking when I'm going to get rid of this piece of work. I know what I have but now seeing the need to get a new vehicle. This is a really good little car, so glad I have one. I have had my versa for 6 yrs. now and it has been a great car. It was actually my very first new car I ever had. I have not had any major problems with it. I just had to replace the back brakes, they lasted a whole 6 yrs. I thought that was amazing. I have moved with this car a couple times and you would be very surprised at how much stuff you can get packed into this little hatchback. The sound system was pretty good too at least that is what my son told me when I bought it he was 17 at the time. And I love the GPS system helped me many times when I needed to find where I needed to go or to get home. Nissan will notify owners, and dealers will replace the subject inflator with a new one manufactured by a different supplier, free of charge. Remedy parts are not currently available. An interim owner notification letter will be sent by the end of September 2017, followed by a second letter when remedy parts are available. Owners may contact Nissan customer service at 1-800-647-7261. Nissan (Nissan North America, Inc.) is recalling certain model year 2007-2012 Nissan Versa vehicles manufactured May 8, 2006, to November 12, 2012, that were sold or ever registered in the District of Columbia, Connecticut, Delaware, Iowa, Illinois, Indiana, Kentucky, Massachusetts, Maine, Maryland, Michigan, Minnesota, Missouri, New Hampshire, New Jersey, New York, Ohio, Pennsylvania, Rhode Island, Vermont, Virginia, West Virginia and Wisconsin. Road salt may corrode the front coil springs, possibly resulting in the coil springs fracturing. If a front coil spring fractures, it may contact the tire, possibly puncturing it, increasing the risk of a crash. Nissan will notify owners, and dealers will replace both front coil springs, free of charge. The recall is expected to begin by mid-November 2015. Owners may contact Nissan customer service at 1-800-647-7261. Nissan will notify owners, and dealers will replace the front passenger air bag inflator with an alternate inflator, free of charge. The recall is expected to begin in July 2018. Owners may contact Nissan customer service at 1-800-867-7669. Nissan North America, Inc. (Nissan) is recalling certain model year 2012-2015 Nissan Versa sedan vehicles manufactured June 9, 2011, to March 11, 2015, and 2014-2015 Nissan Versa Note vehicles manufactured April 23, 2013, to March 11, 2015. The affected vehicles have a center console trim panel that may catch the driver's shoe and delay the transition from the accelerator pedal to the brake pedal. A delay in the application of the brake pedal would lengthen the distance needed to stop the vehicle and increase the risk of a crash. Nissan will notify owners, and dealers will modify the console trim panel, free of charge. The recall is expected to begin by mid-October 2015. Owners may contact Nissan customer service at 1-800-647-7261. Nissan will notify owners, and dealers will replace the passenger frontal air bag inflator, free of charge. The manufacturer has not yet provided a notification schedule. Owners may contact Nissan customer service at 1-800-647-7261. NISSAN IS RECALLING CERTAIN MODEL YEAR 2012 VERSA VEHICLES EQUIPPED WITH AN AUTOMATIC TRANSMISSION AND MANUFACTURED FROM JUNE 9, 2011, THROUGH JANUARY 13, 2012 FOR FAILING TO COMPLY WITH THE REQUIREMENTS OF FEDERAL MOTOR VEHICLE SAFETY STANDARD NO. 114,?THEFT PROTECTION.? DUE TO INTERFERENCE BETWEEN THE SHIFTER ROD AND THE SHIFT KNOB, THE VEHICLES MAY BE SHIFTED OUT OF THE PARK POSITION WITHOUT DEPRESSING THE BRAKE PEDAL. THE OPERATOR CAN INADVERTENTLY SHIFT THE VEHICLE INTO GEAR WITHOUT THE BRAKE PEDAL BEING DEPRESSED, INCREASING THE RISK OF A CRASH OR INJURY TO A NEARBY PEDESTRIAN. NISSAN WILL NOTIFY OWNERS, AND DEALERS WILL INSPECT AND REPLACE THE SHIFTER KNOB OR THE SHIFTER ASSEMBLY AS NEEDED, FREE OF CHARGE. THE SAFETY RECALL IS EXPECTED TO BEGIN ON FEBRUARY 20, 2012. OWNERS MAY CONTACT NISSAN AT 1-800-647-7261. NISSAN IS RECALLING CERTAIN MODEL YEAR 2012 ALTIMA AND VERSA VEHICLES. THESE VEHICLES MAY BE EQUIPPED WITH SIDE CURTAIN AIR BAGS THAT CONTAIN AN INCORRECT PROPELLANT MIXTURE FOR THE INITIATOR COMPONENT USED, RESULTING IN INSUFFICIENT OUTPUT OF COMPRESSED GAS. NISSAN WILL NOTIFY OWNERS, AND DEALERS WILL REPLACE ONE OR BOTH SIDE CURTAIN AIR BAG MODULES, AS NECESSARY, FREE OF CHARGE. THE SAFETY RECALL IS EXPECTED TO BEGIN ON FEBRUARY 27, 2012. OWNERS MAY CONTACT NISSAN CUSTOMER SERVICE AT 615-725-1000. Nissan North America, Inc. (Nissan) is recalling certain 2012 Nissan Versa vehicles. Degradation of the side impact sensor connector pins may cause the curtain and seat-mounted air bags to deploy unexpectedly if the door is slammed. If the curtain and seat-mounted air bags inadvertently deploy, it can increase the risk of injury. Nissan will notify owners, and dealers will install a new jumper harness, and replace the side impact satellite sensors, free of charge. The manufacturer has not yet provided a notification schedule. Owners may contact Nissan customer service at 1-800-647-7261. Nissan North America, Inc. (Nissan) is recalling certain 2012 Versa Hatchback vehicles that were sold or ever registered in the District of Columbia, Connecticut, Delaware, Iowa, Illinois, Indiana, Kentucky, Massachusetts, Maine, Maryland, Michigan, Minnesota, Missouri, New Hampshire, New Jersey, New York, Ohio, Pennsylvania, Rhode Island, Vermont, Virginia, West Virginia and Wisconsin. Road salt may corrode the front coil springs, possibly resulting in the coil springs fracturing. Nissan will notify owners, and dealers will replace both front coil springs, free of charge. The recall is expected to begin November 27, 2017. Owners may contact Nissan customer service at 1-800-647-7261. This campaign expands recall 15V573.